Discussion in 'GarryP's Trojan Huddle' started by GarryP, May 1, 2018. Garry, I was watching the 1998 Nebraska v. Tennessee Orange Bowl and noticed Scott Frost's play. The play calling was clearly suited to an athletic QB who can run. This makes me wonder if Fink and Sears' uninspired play this spring was due more to a playbook that wasn't suited to their skill sets, than it was their actual talent. I know this is hypothetical, but if these two QBs ran plays more from Nebraska's playbook than Helton's, would they have looked more impressive? 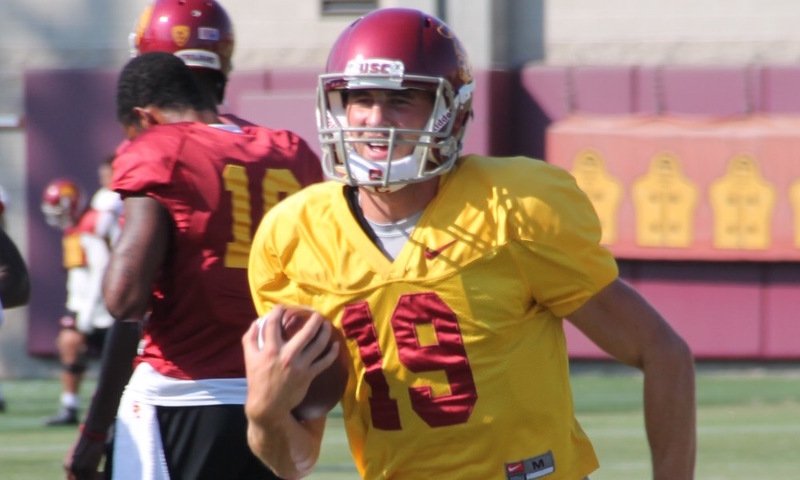 If Fink gets the start, is there any chance USC runs plays more suited to his talents than JT's? If we run last year's playbook, we will NOT do very well, IMHO. Garry I am not sure if this is the right platform to ask the question but I will ask for anyone that is willing to answer/direct me to the right place. We have seemed to develop a trend of accepting commitments of prospects early on the recruiting year, between spring and fall camp, to have the majority of them "decommit" when we coming down to the wire. 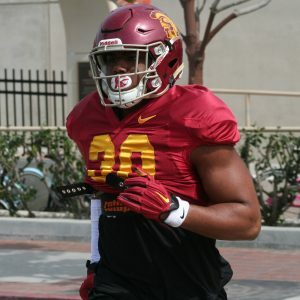 I understand the notion that Helton may or may not have explained the situation to them, but why accept the commitment from the prospect if we are going to take the "reservation" from them to make room for someone else? why accept the commitment from the prospect if we are going to take the "reservation" from them to make room for someone else? Perhaps to throw other schools off the trail of kids they really want? What is the SC Administration saying on the record and more importantly, off the record,, regarding the McNair trial? What will be the verdict in the McNair case? Garry: How many scholarships remain unfilled for the coming season? Since we missed on the 2 grad transfers we were targeting, any guess on who fills the remaining spots-- or maybe we leave them open? We did see more designed QB runs this spring than we have in the past, and all three QB's next year do have that running element, but I don't think we've seen a clearly defined way in which that would be used. With those Nebraska teams, they were about as clearly defined with what they wanted to do as any team you'll find, and they recruited to that system up and down the roster (including a senior QB in Frost who fit them perfectly). 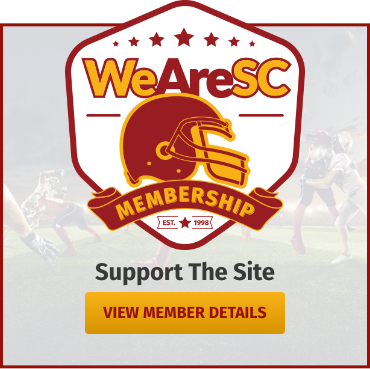 It seems like the USC offensive scheme is still finding its way under Helton, its putting up good numbers and recruiting good talent, but we've yet to see a clearly established identity. The communication part is not a small thing and Helton obviously does that well because we've yet to hear a recruit complain about the way they've been treated. I'm not a huge fan of the "reservation" route, as you call it, but it's become more and more a part of how things are done in recruiting these days, and you don't always know which players will end up here in the end. When Velus Jones was a longtime commit it was basically considered a done deal that he would end up elsewhere, yet here he is on the roster with a chance to have an increased role this year. I'm wondering if the early signing period will have an impact on this trend, and if we won't see it as much this year or in the future. There hasn't been anything on the record for a while, the last statement I remember seeing was when the NCAA e-mails were released and there were joint statements from university counsel and from Pat Haden. What was interesting about those statements is that both of them referenced the fact that the NCAA appeared to have gone against their own guidelines by allowing people outside of the COI to weigh in with their opinions to COI members. That still looks to be a key point in the case from what we've seen so far. There isn't much off-the-record either. The administration took the stance a while back to just get past the sanctions and you don't really hear any talk about the case or where it's going. 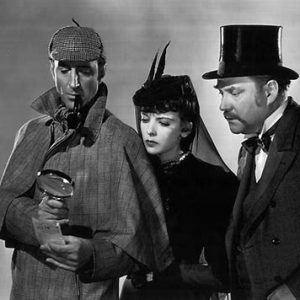 There is always the chance that there could be some negotiations taking place when the trial is over, depending on how things go, but things are quiet now. Hard to answer that when the NCAA hasn't presented their case but my view from what we've seen so far is that McNair will earn some form of victory but it won't be for a crazy amount of money. The NCAA has really focused one of their points on how hard he worked to find a job and the fact that they "only" gave him a one-year show cause. I'm guessing a lot will depend on how well Broillet is able to tie together their missteps in his closing arguments. As I understood it we had four spots that we needed to open up and there were 7 players who left, which would mean 3 open spots for the fall. With those Nebraska teams, they were about as clearly defined with what they wanted to do as any team you'll find, and they recruited to that system up and down the roster (including a senior QB in Frost who fit them perfectly). 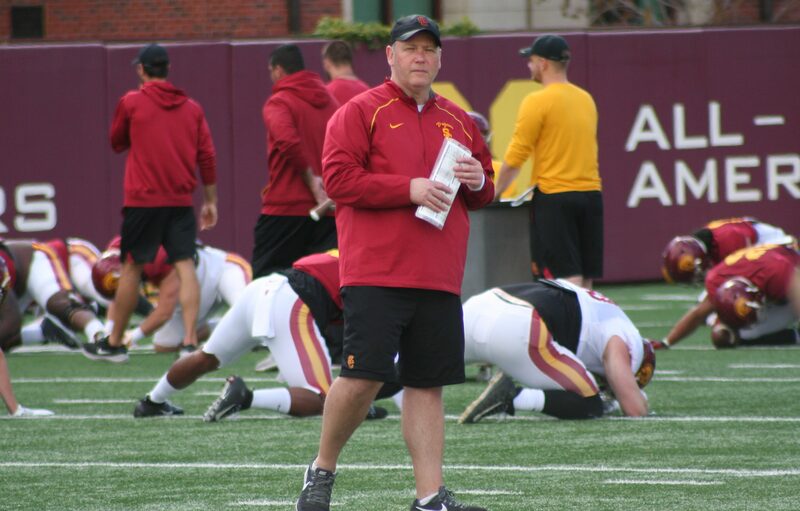 It seems like the USC offensive scheme is still finding its way under Helton, its putting up good numbers and recruiting good talent, but we've yet to see a clearly established identity. You can say that, again. Garry, any word on where Lewis is going? A shame the kid has to go. No, haven't heard anything on a destination. I saw the article about the 3 senior defenders with possible first round projections. Do you really think it is realistic that Cam Smith goes in the first round? He's been a great player for the Trojans, but he's neither a guy with great speed or pass rushing ability. Do you think he's quicker/faster than he appears to be on TV? 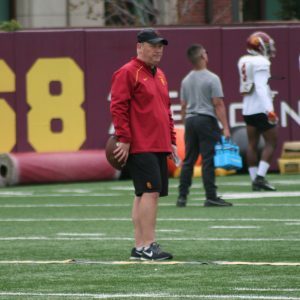 Garry... Will USC go after the NCAA if evidence is proven in the McNair case , that the NCAA was bias; and conducted a witch hunt for personal reasons against USC? I think Cam checks off so many boxes of being a first-round pick but if it doesn't happen it would probably be due to the speed factor. It's just a reality at the next level that speed often separates guys and that's not Cam's strong suit. Troy70 and CrownoftheValley like this. 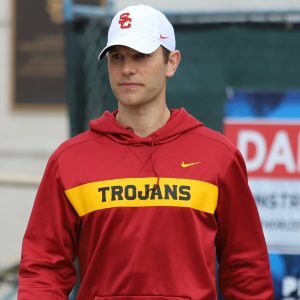 There hasn't been any indication that USC would be looking to go after the NCAA, on the contrary it has long appeared as if Nikias was looking to put the sanctions in the rear view mirror and move on. If the McNair case is resolved with those points being critical to a losing case for the NCAA, I'm hopeful of a negotiation between USC and the NCAA that allows for a return of vacated wins and more. Several years ago a guy who knew Haden talked about Pat taking the long term approach with the NCAA, of getting them backed in a corner (and he referenced this lawsuit) and being able to say "we accepted your original ruling but now that it's proven you broke your rules to get that ruling, here is what we need now". I have no idea if that will happen, but I'm hopeful. redeye, Pudly76, Islander 4 USC and 4 others like this.